Here's a cool mix of custom manufacture, geography, and modern design. 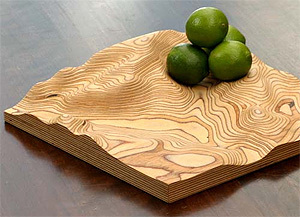 The European company Fluid Forms lets you specify any location on Google Maps, and then they custom mill a laminated wood bowl matching the topography of your choice. A bit pricy at 230 Euros. But very cool.